A Soviet Poster A Day: That's the way to advertise! That's the way to advertise! 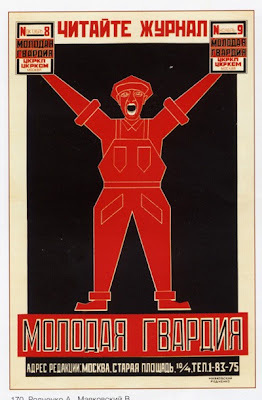 This is another work by constructivist classic Alexander Rodchenko and soviet poet Vladimir Mayakovsky. This is an advertisement which promotes “Young Guard” literary magazine. Russia was always a country where literary magazines (or “thick magazines”) were extremely popular due to fast publishing cycle, as some times it took years for a book to hit the stores. Besides even the most remote libraries always had those magazines available. In the early twenties “Young Guard” magazine was formed by members of “Young Guard” literary society. Its members were writing revolutionary articles and books as well as speaking in public promoting education and revolutionary values. In the sixties and seventies the magazine was a symbol of stagnation, publishing conservative socialist-realism fiction and bad science-fiction stories. But the name “Molodaya Gvardia” – “Young Guard” became well known in Russia because of the WW2, and it was not the magazine, which had set the stone rolling. During the war "Young Guard" - an underground anti-fascist organization formed by young Komsomol members from Ukrainian town Krasnodon were performing guerilla actions against occupation forces of Nazi Germany. They were betrayed, tortured and finally executed. After the war revolutionary writer Alexander Fadeyev wrote an exciting fiction book based on the event. The film followed. And finally the “Young Guard” heroic myth was born. A publishing house, a huge bookstore, a pioneer camp and numerous other facilities, goods and things were named “Young Guard”.